It's worth mentioning from the start that this is a two-man assembly machine, which should give you an indication of its weight and build quality; plenty of heavy metal, which always makes for a solid platform on which to build. Self-assembly was smooth and all but one necessary tool was in the box to complete the task, along with a useful set of instructions. As I have no problem with accepting engineering tolerances within timber construction, this piece of equipment sits comfortably in my workshop so long as it is reliable. The main table is attached to the central column via an adjustable mechanism capable of horizontal as well as bevel alignment. 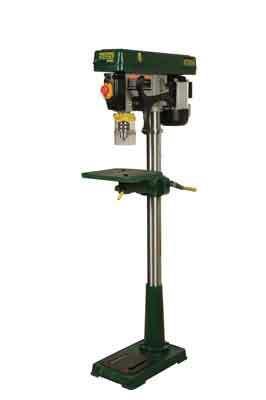 A crank mechanism allows vertical adjustment of the main table as well. Locking off all of these moving parts was easy and left me feeling confident about the machine's capability. A natty system for releasing tension on the drive belts makes for simple speed adjustment. The motor is suspended on two metal rods which can be levered back and forth via a specific handle; this could do with being a bit longer for more leverage. Locking off at the correct tension is achieved by two separate knobs on each side of the main housing. A diagram on the inside of the belt guard lists the 12 different speed setting positions. 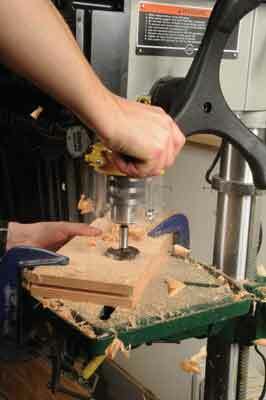 With sample pieces of timber clamped in place I was able to test the machine's ability to drill a straight hole. And that is exactly what it did. The DP58P has a depth control with indicator and scale that were accurate to within 0.5mm. The cast-iron 3-spoked feed wheel was a bit rough around the edges but comfortable to use. I managed to bore holes of 80mm (3 1/4in) diameter using a Forstner bit with relative ease in a piece of steamed beech, and I strongly suspect that with good-quality sharp tooling this machine could cope with more. In my opinion, this robust and accurate piece of tooling deserves a place in any workshop. It did exactly what I expected of it.